Construction cranes tower over the city's two- and three-story shophouses and hotels -- the din of diggers and drills drowning out the capital's increasingly dense traffic. 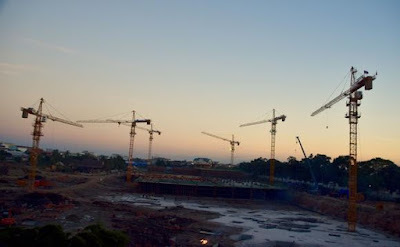 "So many shopping malls now -- around 20 going up all around the city," said Pouthong Sengchanh while standing over a model of the Vientiane New World project, a mix of shops, restaurants and offices newly stretching along the city's Mekong riverfront. Inevitably, perhaps, Vientiane New World will include a mall of its own as the final stage in the project, scheduled to be completed by 2018.